If I asked you to describe your favorite food, what would you say? What terms would you feel adequate in describing how you value it? Would you tell me about the calorie content, the nutrient benefits or instead focus on how such food makes you feel? It’s funny the categories that we put around food, I notice myself doing this as well when I try to write descriptions for my recipes. Do I call this vegan? Plant-based? Vegetarian? We both know I’d prefer to put ‘yummy x 1000′ and ‘favorite‘ for everything I create, but that’s not very helpful in telling you what is is (or for SEO). If you scroll through Instagram or Facebook, you’ll see all the food labels in their glory. Recipes promoted as ‘clean’, ‘healthy’, ‘good’, ‘skinny’ and so on. In some ways, I get it. As a blogger who makes an income off page-views, I understand the temptation to label things in such a click-bait way. I know that recipes promoted as ‘detox’ and ‘skinny’ sadly get a lot more views than those without them. So, we can agree that labels exist. I use them, you use them, we all use them in various ways. Sometimes they are helpful; I love seeing a vegetarian label when I go out to eat so I know I’m not accidentally ordering anything with meat, but most of the time- they aren’t. The real problem with labels is how they make us feel. How they encourage us to moralize our food choices. Especially ones that use such descriptors as ‘good’ and ‘bad’. Many of us use food labels so often, we may not even notice how these labels actually affect us. A brownie, my favorite dessert, would likely be labeled a ‘bad’ food. What, with all the processed flours, sugars and lack of nutrients. Especially if we compare it to a ‘good’ food, like kale. Imagine I’ve been thinking about having a brownie all day. Telling myself that I need to be ‘good’ for lunch so I can be ‘bad’ for dessert and get the brownie. Perhaps I’m out with friends who are shocked that I’m ordering the brownie, so I remind them how ‘good’ I’ve been lately or maybe encouraging one of them to split it with me so I won’t be so ‘bad’. Sound familiar? This kind of moralizing behavior, while dramatic in the story above, is very common. I hear a similar case all the time from my clients. Of course, not moralizing your food is easier said than done. One huge reason for this is that it feels true that kale is good for you and the brownie is bad you. How can you stop thinking this way when you actually believe it? Food is inherently neutral. A food cannot be morally good or bad, regardless of the effects it may have on your health. Consider a sharp knife. Two people can look at the same exact knife, with one of them seeing a weapon, something to be feared and the other person sees it as a tool to cut food with. The knife itself is neutral, but we attach a moral value to it based on what we perceive its effects to be. Spoiler alert: we do the same with food. This pattern isn’t healthy and the first step in breaking it is stop labeling foods as ‘bad’. As mentioned above, it’s hard to drop labels when they feel true. It feels true that the brownie should be a ‘bad’ choice nutritionally and the kale salad should be a ‘good’ choice. However, when you label the food, you aren’t able to be fully present while eating it which suppressed natural feedback from the body. Let’s take the brownie example again. If I were to eat the brownie that I told myself was ‘bad’, I’d be focusing on how many bites I was taking, how many calories I thought I was getting from the brownie and what a ‘treat’ I was having. This doesn’t allow me to process the actual signals that my body is giving me. A small amount of brownie feels good, too much and I don’t feel as good. That’s natural feedback that I use to then decide food choices going forward. The opposite is also true. If we feel morally ‘good’ because we ate a ‘good’ food, then we may start to eat that food more out of obligation or guilt than actual choice or pleasure. This then makes healthy eating feel like punishment, not a choice. Feedback is good. We want to understand how certain foods make us feel. Of course, not every meal will be an ‘aha’ moment, but knowing how foods impact you can help you when you have various cravings or are looking towards food for a certain satisfaction. Dropping the labels allows us to own responsibility. We get to decide what food we want, how much we want and when. This power shift is a constant reminder that you are in control of your food choices, the food doesn’t control you. When you label foods as ‘good’ or ‘bad’ you give them moral power. Just like the knife above. The food (or knife) isn’t inherently good or bad, so don’t give it power to be so. I know this isn’t easy work. In fact, I often argue that not following a diet is the harder path. It’s fairly easy to follow rules and create labels because black and white seems safer than grey. 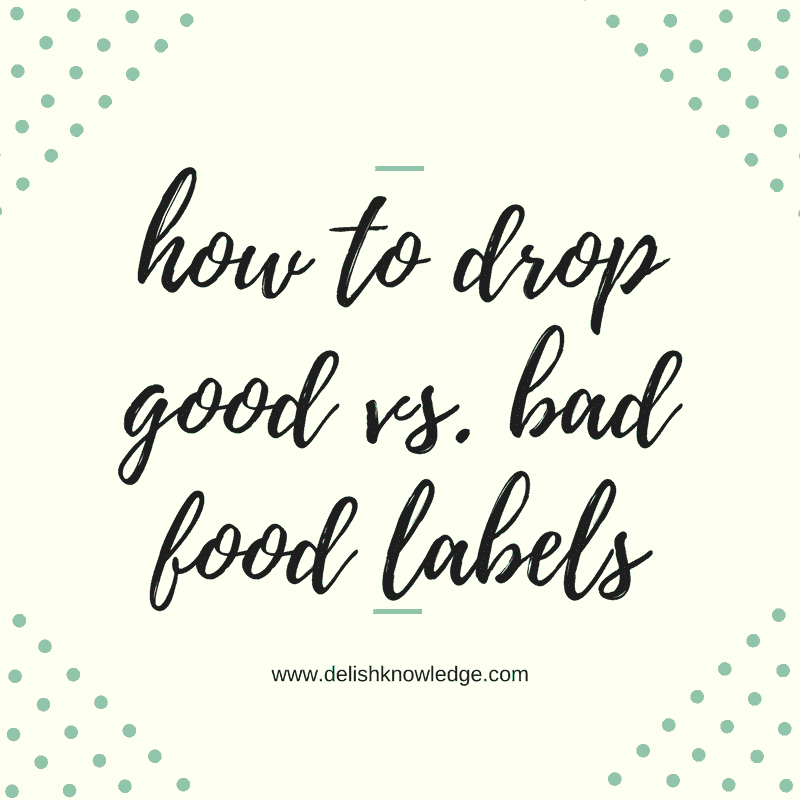 We often don’t trust ourselves around food, hence the need for rules and labels in the first place. But, I encourage you to try. To become more aware of the labels that you put around foods. Notice how your experience with the food changes as you drop the labels. Sometimes with clients I try this experiment; I have them write down a list of foods they consider to be ‘good’ or ‘bad’. Then, see if you can come up with other words to describe them that have nothing to do with their moral value. Focus instead on how the various foods make you feel. Then, see if you can try such foods with a different, non-judgment label. How does the experience change? Great article! Explained this important, healing concept very well! Great blog! I’ve heard this concept explained so many different ways, but this was truly unique and helpful. I’ll be sharing at on my FB at Baby Bloom Nutrition!